Note that the .com may change to something else when you click the link above, depending on where you live. Don’t fret–that’s by design. I will leave this existing blog intact for the sake of posterity. Thank you John (at Hypnagogue) for sharing your thoughts in your review of The Time Collection. Two and a half hours of deep, flowing, textured classic ambient music from Altus? This is what is known as “a very good thing.” Having listened to The Time Collection several times over, I feel confident in saying that this release deserves a place alongside similar benchmark recordings such as Roach’s Quiet Music series. My thanks to Richard Gürtler for his glowing review of The Time Collection. Richard is a very active collector and has been reviewing music for many years. I’m honoured to have my music as part of his collection. Thanks again, Richard! “Illusionary Progression”, a nearly 15-minute soundscape ignites the journey with subtle organic intro, but soon utterly spacious drifts steal the show. Catchy undulations with fascinatingly increasing intensity venture into the deepest corners of atmospheric bliss. Magnificently crescendoing soundsculpting leaves me breathless after few minutes. What a journey, you must experience this!!! To me, an immediate magnum opus entering the pantheon of the giants of deep ambient voyaging!!! Bravo, Altus!!! “Like Sand Through Fingers”, love that title, is only slightly shorter than its predecessor, but as much immersing. Less intense, more static at the beginning, choir-like drones continuously arise, smoothly nuanced and accompanied with eternally intangible tinkles. Enigmatic intensity inconspicuously permeates through graciously amorphous blankets, while hissy fragments emerge here and there. Another triumphant composition!!! “Absolve The Past” immediately dives into grandiosely symphonic terrains, enchantingly yearning and gorgeously tiding, with voluminous cinematic touch. “Live For The Now” is filled with interstellar grandness, gracefulness and magnificence. “Brave The Future” continues the odyssey with soothingly expansive washes, gliding, cascading and evanescing through ephemerally piercing altitudes. “Aetas” closes “Part I: Ghost Of Time” and delves into magnificently subterranean sceneries, exquisitely immense and enthrallingly transporting. An array of drones and transcendental choirs are hauntingly sinuous and meticulously reinforced by transient, yet insidiously puncturing outbursts. Colossally fascinating conclusion!!! “Part I: Ghost Of Time” is a real treat for each connoisseur of pure atmospheric driftscapes!!! “Part II: Time Forgotten” unfolds with nearly 14-minute “The Patience Of Eternity”. An ultra deep dronescape descending into shadowy zones of unfathomable depths. Monumental layers of intenser monochromatism are masterfully bridged with glimpses of dramatically illuminating dissonances counterpointed with warmer, more peaceful deep sea sceneries. 16-plus minutes long “Memory Thief” continues delving into perplexing zones, carving mesmerizingly mindscaping helixes, ear-tickling surges continuously awake and climax, and ethereal voices gracefully cruise above. “What You Leave Behind” merges serene, but immensely embracing undulations with wistfully euphoric string-like patterns. Soothingly meandering with immense billows. The closing, 30-minute “Walk With Oblivion” dives into fascinatingly otherworld realms sculpted with breathtakingly abyssal drones, splendorously fragranced with spectacularly flickering lights. A fully rewarding thrilling crescendos and transcendental transitions continuously emerge. This must be Altus at his most creative, grandiose and shapeshifting!!! A grand finale!!! Undoubtedly, compositions such as “Walk With Oblivion” or “Illusionary Progression” are the best examples why I am journeying with this kind of music, thank you so much, Maestro!!! “The Time Collection”, recorded between July and November 2014, is absolutely triumphant recording of Mike Carss/Altus, showcasing his huge auralscaping potential. A true sonic monument, hauntingly displayed also by Mike Carss’ long exposure time photographs. The gates of Atmospheric Heaven are unlocked!!! Hats off to Mike Carss/Altus!!! As mentioned above, sold out for long time, but I really hope this is not the last CDr installment by this Canadian. The next step might be a glass mastered CD, if not, then there is no justice in this world!!! “The Time Collection” is available as free download since February 20th, so there is no excuse for not owning this milestone!!! Act now!!! Check out a new single from Altus: Nearly Forgotten, part of Ambient Sleeping Pill Volume 4 from Stereoscenic. Funds raised go toward hosting costs for Ambient Sleeping Pill, an immaculately curated internet radio station. Be sure to check it out if you’ve never tuned in. This track was originally part of the writing sessions for The Time Collection, but was put on the back burner and never used. For those who’ve been waiting, The Time Collection is now available for free download. I’d also like to thank the crew and DJs at Stillstream for the massive amount of airplay they’ve given the release over the past month and a half. Anyway, enough babbling from me. Go, download it now. Enjoy! Thank you for everyone who purchased a copy. Of course, FLAC and MP3 downloads are still available to purchase. NO PURCHASE IS NECESSARY to download this release. If you wish to support the Altus project,or don’t want to wait . . .
Own a piece of Altus history. This numbered, limited edition 2-disc CDr set (Taiyo Yuden brand) is protected in a sturdy metal tin. Alternatively, you can purchase access for the FLAC and MP3 downloads for $6 CAD. Click below for more details, including full-length previews. The release for The Time Collection is less than a week away. Check out the preview/review from Sonic Immersion to whet your appetite. […] a profound lost-and-found feeling runs as an undercurrent through this most fulfilling and gracious body of work which addresses a celebration of life in the moment, but also honors/remembers those who passed on and are sorely missed by each of us. John at Hypnagogue has written up a lovely review for Excursion Three. On January 7th 2015, 40 unit will be available for sale. 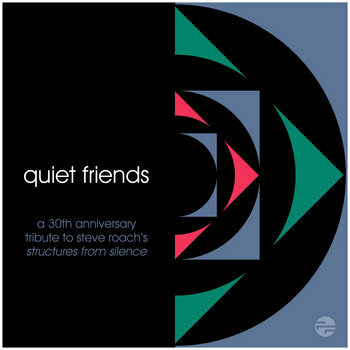 At long last, the Steve Roach tribute “Quiet Friends” has been released and is available on Free Floating, which features singles from 15 artists, including Altus. It’s free to download and enjoy on the Free Floating Bandcamp page.